250 E. Pearson, also known as simply “The Pearson,” is an extravagant Streeterville high-rise that couldn’t be in a better location. With Lake Shore Park right across the street and Michigan Avenue just a few blocks away, it’s easy to see why residents absolutely adore calling The Pearson home. 250 E. Pearson was built back in 2003, stands 37 stories high, and houses 180 individual condominiums for sale. The size of The Pearson condos for sale ranges from one- to three-bedrooms, and the common amenities here are absolutely first-class. 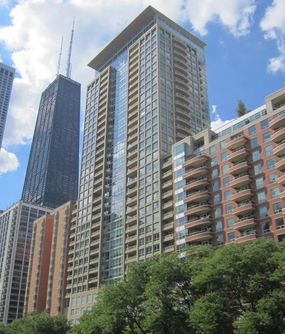 To start viewing active condos for sale at The Peason at 250 E. Pearson in Chicago's Streeterville neighborhood, check out the featured listings below, or call us today to schedule a showing! As mentioned above, condos for sale at The Pearson are about more than just high-end interiors. Along with fabulous living spaces, residents here will enjoy a host of in-building amenities that include bicycle storage, an exercise facility, a party room and sundeck, and of course easy access to the park across the street. On-site parking at The Pearson is also available, as most condo owners here own cars as well. The Pearson condos for sale are certainly part of the luxury market, as you won’t find many opportunities to buy here for under $500,000. Interior finishes include floor-to-ceiling windows, hardwood flooring, granite counters, and of course a private balcony that enables residents to take in the amazing views of the lake and Lake Shore Park below. Hardwood flooring, functional layouts, and upgraded kitchen and bathroom features are also part of most living packages here at The Pearson. To learn more about The Pearson condos for sale at 250 E. Pearson, call us today at (312) 953-0961.